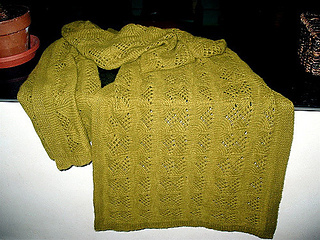 Summary: Rectangular shawl with a simple lace pattern and garter-stitch borders. From the pattern description: In the Himalayan Mountains between Tibet and India, Cashmere goats are raised for their fine fleece. The poor men of the villages collect abandoned birds’ nests that have been lined with bits of cashmere. The women sit for hours picking the cashmere from the nests and hand spinning exquisitely fine yarn. Then they weave this yarn into wonderfully prayer shawls that are light as a feather and possess a truly magical and comfortingly quality. Here is a knitted version of this shawl. Needle: 24” circulars in both sizes.